We're not just about cubicles anymore! Five years ago I wrote this article about what I considered the 5 key characteristics of a great office chair. At that time, I had just upgraded my home office chair to the one in the article. Well, office chairs have certainly changed ergonomically for the better over the years and just recently I decided to embark on another office chair upgrade. 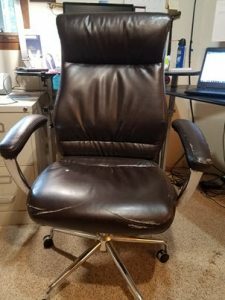 I was having some recent back problems and I realized that my home office chair was old and really wasn’t supporting my lower back the way it should. My employer gave me a new office chair at work recently (middle image below). It wasn’t ideal because I had to take what they offered. I really liked the support and it was lightweight with the same technical mesh material on the back portion of the chair that I found with my new home office chair, the Staples Hyken Technical Mesh Task Chair, on all surfaces. 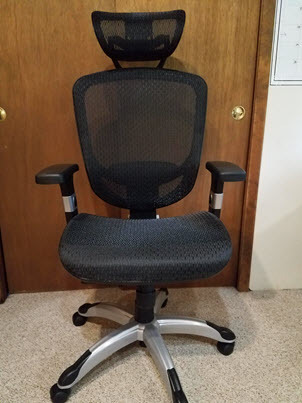 Since I had many more options purchasing my new home office chair, I decided to pay a little bit more to get exactly what I wanted in lumbar and neck support which you can clearly see in the image on the right. It’s not like I broke the bank with my new home office chair upgrade. I spent $139.99 at Staples, which is an office superstore. 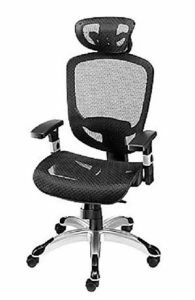 The same Staples Hyken Technical Mesh Task Chair provided in the Amazon link is $179.95 but includes free shipping. For the money I feel it’s an excellent value especially if you just check out what you can pay for an office chair! What I really like about Staples is that they have many chairs already assembled so you can sit in each one of them to see what really works for you. I could never just buy an office chair out of the blue without testing it out or without a very good recommendation from someone I can trust. I’m very picky and I really need good lumbar support and generally overall comfort and ease of use. This new office chair upgrade has really worked wonders for my back. It’s almost like as soon as I set it up and started using it, my back pain disappeared. I also really love the arms which are comfortable and are adjustable up and down if needed. It took me about 45 minutes to assemble the new home office chair and it has been rock solid since. My favorite part about this new chair, other than the really good lumbar support, is the breathable technical mesh which is not only comfortable but appears very durable. You can see above in my new office cubicle chair the technical mesh is on the back of my chair but not on the seat. With my new Home Office Chair the technical mesh is on the seat and the back of the chair. It’s very common in office chairs these days to use this material and after using it now for a few months, I can certainly see why. 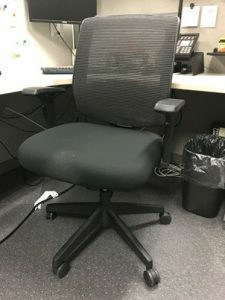 The features of a Staples Office Task Chair can be seen below. Covered in comfortable and breathable technical mesh. Lumbar and neck support are key features. Pneumatic lift to adjust to various heights. Arms also adjust to different heights to suit your needs. If you too are ready for an office chair upgrade, you might want to consider the Staples Hyken Technical Mesh Task Chair. So far I love it and I'm extremely pleased with the value of this ergonomically-sound office chair.